Dear Readers, this week the search for a Wednesday Weed sent me in a completely different direction from my usual route. On a rainy, blustery day, I headed off towards our local primary school, to see if the playing fields there had anything growing that I had not already covered. In vain I peered through the fence at the turf, until my eyes refocused and I realised that I’d been looking at my subject all along. For what is more surprising on a January day than a plant that is already in full flower, ready to reproduce when everything else is still in bed? 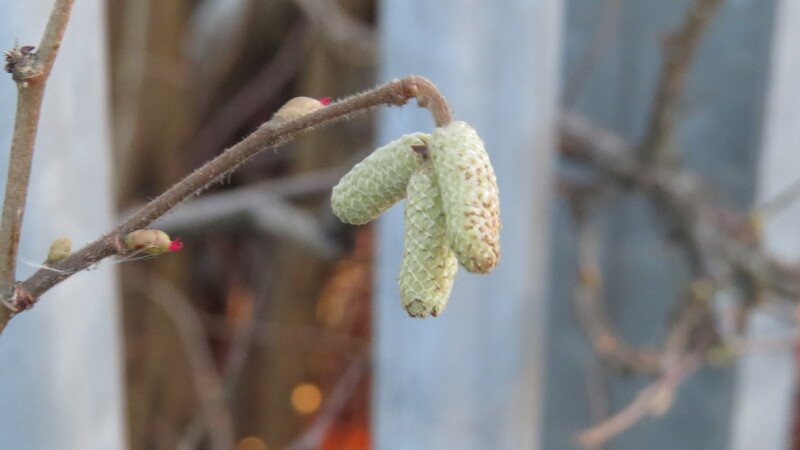 The male Hazel catkin has the delightful colour of a sherbet-lemon. With every damp gust, invisible clouds of pollen are released. With any luck, they will be captured on by the red female flowers who wait with open arms, a little like sea anemones. It is these female flowers that will eventually turn into hazelnuts. They will promptly be nibbled off by squirrels or, if we are extremely lucky, by dormice. 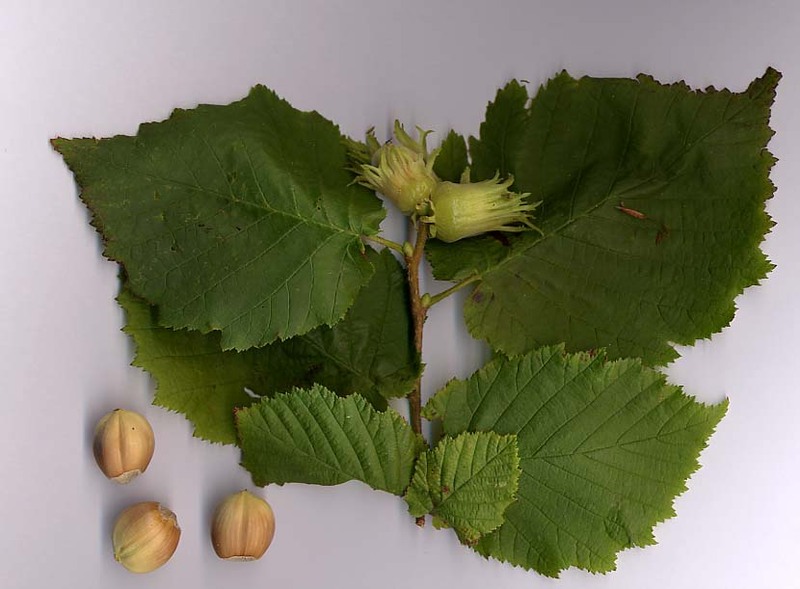 Kentish Cobnuts, with their creamy white interiors and little hats of pale green, are a domesticated variety of the hazelnut, but the wild variety is perfectly good to eat, and was, indeed, one of the staple foods of prehistoric peoples. Hazel has grown in the UK for at least the last 6000 years, and only birch was quicker to colonise the country after the last Ice Age. The spread of the plant throughout Europe has been attributed to its being carried from place to place by humans. After all, nuts are a concentrated, portable form of protein and carbohydrate. What better food if you’re embarking on a (very) long walk? The Hazel growing beside the school playing fields has turned itself into a small tree, but historically it is much coppiced, the stems being used for a wide variety of purposes. They are extremely flexible, and can be turned back upon themselves or knotted. 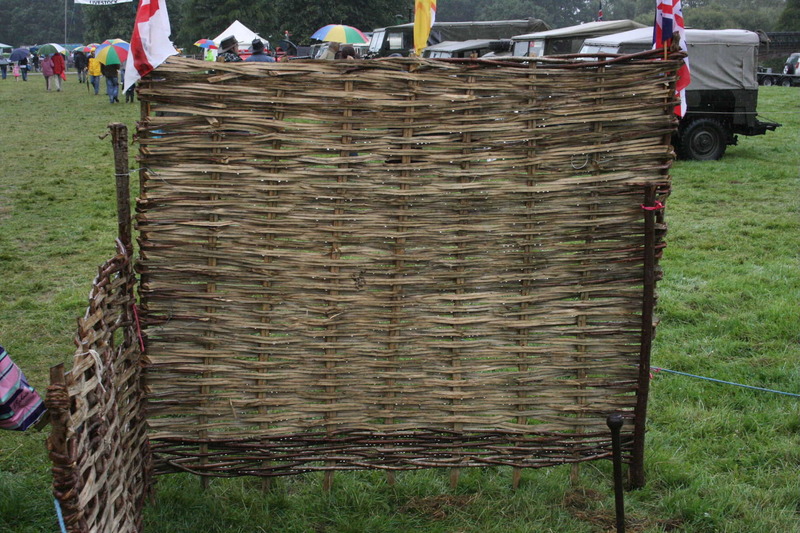 They were woven together to form both hurdles and fences, and were also used as the framework for wattle and daub walls. 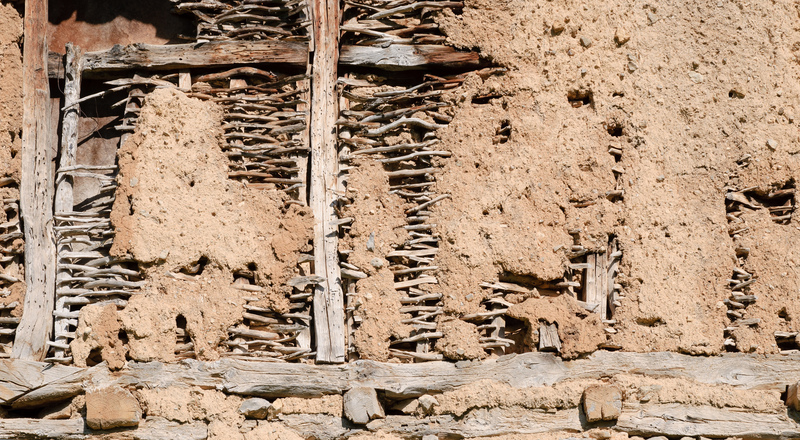 They are still used in thatching, to hold the thatch down, because the hazel stems can be bent through 180 degrees. A more modern use is in the creation of sound screens alongside motorways. 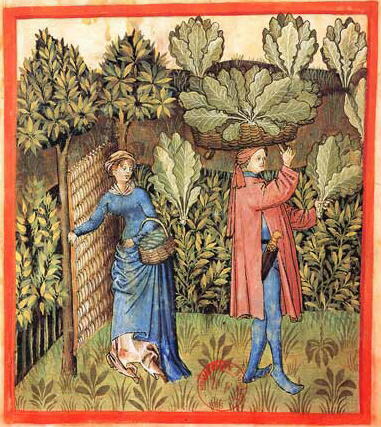 Here, a Wattle gate is used to keep the animals out of the 15th Century cabbage patch. This is from the Tacuinum Sanitatis, a medieval handbook on health and well-being, and well worth further study. A plant which has lived alongside us in these islands since the very beginning, Hazel has many associations with Druid and Celtic beliefs. Its stems have been used for water divination, and for the making of shepherds’ crooks and pilgrims’ staffs. A Hazel tree was believed to be the home of Bile Ratha, the poetic fairy of Irish folklore, and it was believed that eating hazelnuts would bestow wisdom. On Dartmoor, Hazel was said to be the cure for snake and dog bites. And, to prevent toothache, you simply have to carry a double-hazelnut in your pocket at all times. The catkins are shivering in the wintry blast, and so am I. Parents are tearing past me in their cars, hurrying to pick their children up from the school gate and giving me a decidedly funny look as I stand in the rain, peering through the fence with my camera. I wonder if any of the children will get the chance to admire the catkins, the first sign that the long dark is finally loosening its grip. I hope that someone will take the time to show the little ones the ‘lambs tails’, and explain to them about this plant. After all, we have been living together, side by side, for six thousand years. 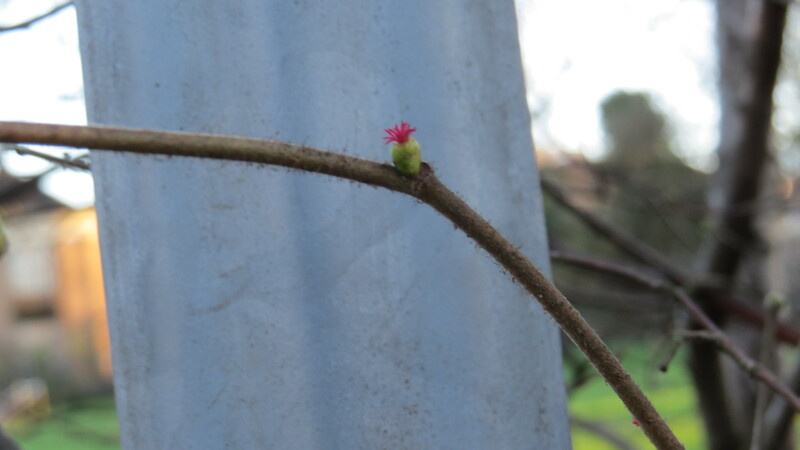 This entry was posted in London Plants on January 14, 2015 by Bug Woman. In Coldfall Wood there are just a few hazel trees and a very few hazel saplings that have been dead-hedged around for protection. It’s thought that there were once many more. The ‘Winter trees’ walk in the wood on 21 Feb might shed some light on the hazel situation, perhaps. Thanks Ann – Hazel certainly doesn’t like deep shade, so maybe the coppicing work will encourage some to come back. On another note, a huge (40+) flock of chaffinches in the wood today – have any turned up in your garden yet? 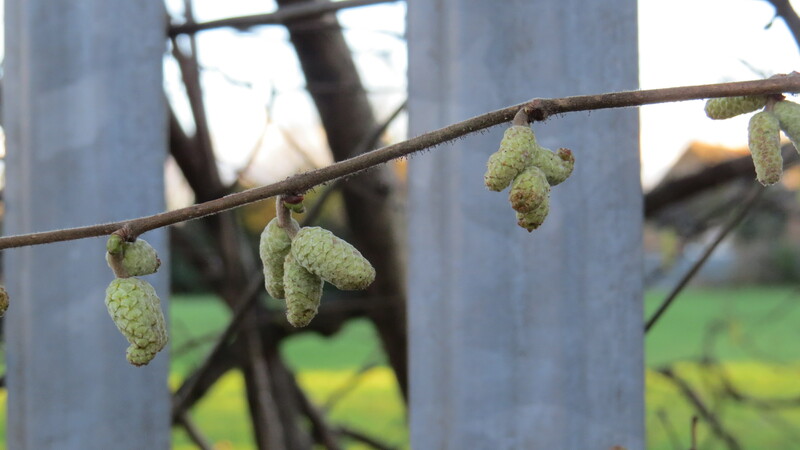 Unfortunately we probably won’t see any new hazel in Coldfall unless we specifically plant/propagate it. I don’t think I’ve ever found a seedling hazel in the wild and I spend quite a bit of time in hazel coppice! It’s hard enough to find nuts to plant as the squirrels start eating them long before they’re viable. Hi Iain, very interesting….I had heard that the squirrels were devils for the hazelnuts, but I hadn’t realised they were quite so impatient! The hazel in this piece is by Martin’s Primary School playing fields, there are a few of them there. Not sure if they were planted deliberately or if they are remnants from whatever was there before. Really looking forward to your Winter Tree Walk in Coldfall on Feb 21st by the way. I am on something of a steep learning curve at the moment! 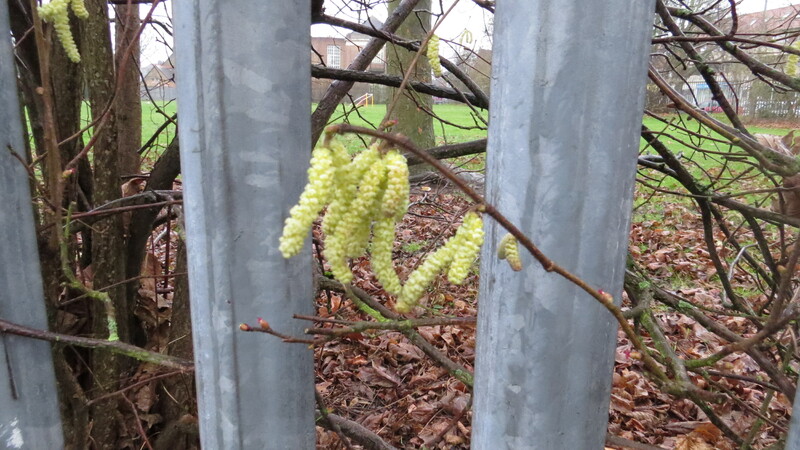 Ah – catkins! Miss Edie devoted one of our earliest Nature Study lessons to the catkin, and she had a jam-jar of them on her desk, which we were to draw. I had the impression that they were a special children’s thing, in which we were supposed to lose interest one we were adult. Yep, catkins and tadpoles and dead leaves and putting a buttercup under your friend’s chin to see if she liked butter. All ‘childish’ things. I wonder how many people put them away, with regret, only to rediscover them as they grow older? My heart aches for the many children growing up now who will never draw a catkin, or watch as a tadpole turns into a frog….